The traditional practices of slash and burn agriculture practice in Indonesia has generated smoke and is made up almost entirely of very tiny suspended fine particles ( i.e. particulate matter 2.5 or 2.5 microns or smaller). Long-term exposure will cause cardiovascular effects, such as heart attacks and strokes, reduced lung development especially for young children and may lead to the development of chronic respiratory diseases, such as asthma. 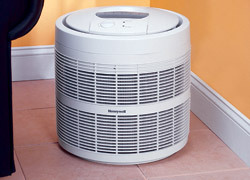 Which air purifier is recommended? HEPA filter removes at least 99.97% of all particles as small as 0.3 microns. Atomic Energy Commission developed HEPA air purifiers to capture radioactive dust particles. Hence, only very small particles are able to pass through the HEPA air filters. In addition, they also trap allergens such as dust, pollen, mold spores and tobacco smoke effectively but they are not recommended for trapping ultra-fine particles such as viruses or eliminating Volatile Organic Compounds (VOCs)(found in a wide variety of common household products: paints, varnishes, cleaning supplies, disinfectants, glues and adhesives, and even new carpet and building supplies) or chemical fumes such as like benzene, chloride, formaldehyde, ethylene, and toluene. 3. Price: HEPA filter is more expensive due the size, better quality, material, and construction of the actual filter media that contributes to the air purifier's better performance. Charged Media filters collect particles on fiber filters and are able to collect very small particles as fine as 0.1 microns. They are ideal for absorbing gases and odors, kitty litter, tobacco smoke, various toxins and gaseous pollutants like indoor pesticides or aerosols that are too small to be trapped by a HEPA filter. However such filters need to be replaced even more frequent replacements than HEPA air purifier. 2. Square feet: the more square feet indicated for the Charged Media filter, the more particulates it will be able to remove. Such filters, as the names suggest, eliminate bacteria and germs and are often used in sterile places such as hospitals and labs. Such filters adsorb odors, gases, chemicals and fumes which are too small to be trapped by a HEPA filte. Pre-filters help to remove pet hair and other larger particles and are used in conjunction with the filters listed above. They are either made of foam or non-woven nylon. Do note that changing prefilters regularly will prolong the life span of the other filters. Ensure the square footage listed minimally the same or greater than the square footage of the room where it is placed. Also known as the ACH rating, is the frequency of the air exchange in a given room. I.e. ACH rating of 6 means it can exchange the air in a room 6 times every hour. CADR tells us how much air is purified and how well the air is purified. The higher the CADR rating the better. Filters are expensive consumables so check out the frequency and the price of replacement. Some air purifiers are extremely quiet while others are noisy. Consider the location where the air purifier will be placed. For UV air purifiers which makes use of UV blub to reduce airborne germs from passing through the filter, these bulbs are expensive consumables so check out the frequency and the price of replacement. If you want to move your air filter around the house a lot, you should consider a model with casters and handles which make it portable.